Star Wars is a science fiction movie series that began in 1977 with the release of the original Star Wars film, and which soon became a blockbuster trilogy with the subsequent The Empire Strikes Back and Return of the Jedi, and much later, the prequel trilogy of The Phantom Menace, Attack of the Clones, and Revenge of the Sith (see all Star Wars Movies ). From nearly the very beginning, there have been games that were built on, or expanded upon, the Star Wars universe. The following are a few of the board games currently available (also check out the Star Wars Video Games ). R2-D2 Is In (Pop-o-Matic) Trouble! Help Anakin Skywalker and C3PO race around the chamber to save R2D2 from the force field! Give the Pop-o-Matic bubble a pop to get Artoo on his feet! With Artoo's help, you can fly around the board at galactic speed, bring out another pawn to help you, or bump one of your opponents back before they do it to you! Be the first member of the Republic to get all four of your players to the FINISH area and you win! Jedi Knight or Sith Lord? Awesome warrior or mystical thinker? 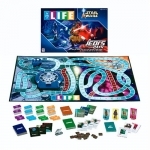 These are the choices players face in Game of Life: A Jedi's Path. As players move their aspiring Jedi around the board (passing tests, doing battle, learning lessons, going on missions, and building their lightsabers), they build their connection to the Force in four ways--logic, intuition, fighting, and energy. Along the way, players can choose the Jedi path or the riskier/quicker "Dark Path." But be careful, once you go down the dark side, there may not be redemption for you. At the end of the game, the mightiest Jedi and the darkest Sith square off to determine the most powerful Force-user in the galaxy. Looking for an opportunity to put that hard-core knowledge of Star Wars-abilia to the test? Well belly up to the cantina to play the Trivial Pursuit: Star Wars Classic Trilogy Collector's Edition, the customized edition of the now-classic Q&A game designed especially for disciples of the three Ls: Luke, Lando, and Leia. With over 2,000 questions in six categories such as Weapons & Vehicles and Droids, Creatures & Aliens, all based on the first three movies in the Star Wars series, this collector's edition features a numbered game board, pewter tokens, and--in lieu of dice--a battery-powered (two A76 cells, included) R2-D2 model which randomly displays a number with the press of his head. For fact-filled fans who know which Endor's up, the Trivial Pursuit: Star Wars Classic Trilogy Collector's Edition means Ewok, Don't Run. Re-visit that galaxy far, far away, with exciting interactive gameplay! Enjoy classic Trivial Pursuit game play with an exciting and entertaining DVD twist. You'll see classic Star Wars scenes and galactic conflicts, while your favorite Star Wars episodes come to life on your television screen. With 1,800 card questions, 600 interactive questions on two DVDs and 100 special cards on screen, and featuring exciting footage from all 6 movies including Episode III, plus tokens in the shape of your favorite STAR WARS characters, this game is the ultimate adventure for any Star Wars fan! The official home page for the Star Wars, featuring information on both the movies and the various board games and video games. Learn about the Star Wars universe, from the free online encyclopedia. Wookieepedia is a Star Wars Wiki that strives to be the premier source of information on all aspects of the Star Wars universe.